For a change of pace, I thought I would review a Bible. Now there is one thing true for any Bible translation, the Bible part of this NKJV is the exact same as any other NKJV Bible. This version of the Bible (like the NIV) is considered to be a sixth grade reading level which may sound low but sixth graders are reading pretty advance stuff. For example, our daily newspapers are written on a sixth grade reading level. 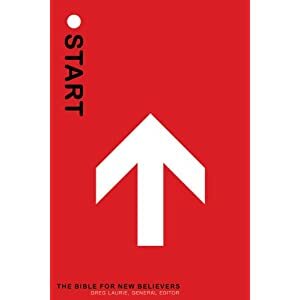 What makes it the “Bible for New Believers” is the study notes, extra tools in the pages at the beginning and end, and the layout. For the most part they are decent and not overwhelming for a new Christian. I enjoy the deeper study Bibles like the “Life Application” or “Faith in Action” but those would be a little much for just getting your feet wet. Some of the tools at the beginning and back are stronger than some of the tools in the Bible portion itself. I really life the explanation of salvation and the pages on the essentials of the faith. The study notes are not the best if they are using the Bible in a group Bible study but they are good and leading for personal Bible study. I would suggest getting the paperback version of this if you are buying it for yourself or a friend. It will be good for a year or so with normal Bible study but not worth investing in a nicer binding like you would for a long-term Bible. Also, for a new Christian, I recommend getting the same version that their church uses so it’s easier for them to follow along. If their church uses the NIV or another translation, this may not be the Bible for them.